The Far Right terrorist responsible for the carnage in New Zealand, didn’t need to post a manifesto online. Everything we need to know about his motivations was written in white marker across his gun. The list of places, dates and names reflects a warped view of history that is steadily gaining ground across the internet – not only in walled-off forums of the Far Right, but across mainstream social media channels. More worryingly, it is finding an audience among young people. This view presents history, especially the history of Europe, as one continuous battle between Christianity and Islam, stretching from the mid-Eighth Century, right up to the present day. It casts those continuing the fight as part of a glorious tradition stretching back centuries. Take a closer look at some of the dates, however, and the narrative of a glorious, holy struggle starts to become undone. We need to understand and identify how to combat those who turn the past against us. The Battle of Tours in 732 is a touchstone of the Far Right online. It is presented as the foundational point of Christendom, when the marauding forces of the Umayyad Caliphate were turned back forever by Charles Martel and his armies, and Europe was cemented as a Christian realm. While it was undoubtedly a massive defeat for the Umayyads, it was hardly the epic clash it has been presented as, especially since the 19th Century. During the advance of the invading Muslims, they had allied with Christian Dukes, such as Odo of Aquitaine in order to smooth their path north. Playing a role in internecine squabbles was just good strategy. While the Crusaders would, in the end, take the city, it was a desultory struggle that showed the victors to be just just as brutal and bloodthirsty as they claimed the Muslim forces to be. The Siege of Acre, in what is modern-day Israel, was carried out by Crusaders, forces from across Europe against the forces of Saladin, during the Third Crusade. Rather than a quick or decisive routing of Saracen forces, it lasted for two years, costing thousands of lives – not only to the wounds of war, but outbreaks of disease. It’s perhaps best known for the beheading of over 2,000 Muslim prisoners by Crusaders, in front of the city walls. In return, Saladin had all his Christian prisoners murdered in a similarly gruesome manner. An ignorance of the past is used to indoctrinate a generation of fighters fighting for a terrible lie. 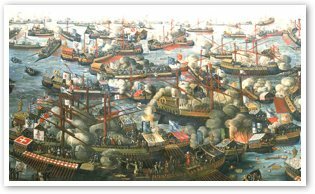 Fought off the coast of Greece between a coalition of Christian empires and kingdoms, and the Ottomans on 7 October 1571, this naval battle has risen in prominence as a date used by the Far Right in their rhetoric – especially during recent mass migration across the Mediterranean. Again, far from a straight battle between the two faiths, the conflict involved a number of Christian captains fighting for the Ottoman forces – indeed, the commander of the Ottoman fleet’s left wing, Giovanni Dionigi Galeni, started life as an Italian, Christian farmer. Likewise, Turkish mercenaries – indeed, mercenaries from across Europe and the Middle East, served the Holy League on their ships. An historical narrative is created that hangs together only in the loosest sense. This is perhaps the most referenced date on the terrorist’s weapon, and it is undeniably the most well-known, thanks to a concerted effort to mythologise it in the wake of the event. The Siege of Vienna in 1683 – the second by Ottomans in the city’s history – was the further reach of invading forces as they sought to take control of central Europe. Led by the Grand Vizier, Mustafa Pasha, the besiegers encircled the city for two months, periodically bombarding it and attempting to dig breaches in the city walls. While it was undeniably a grab for territory, it wasn’t quite the battle over faith that later writers and artists cast it as. Again, as with the Battle of Lepanto, Christian mercenaries played a significant role within the Ottoman forces. Some had a closer relationship and understanding of their Ottoman comrades than their supposed Christian overlords. Trading of food and goods took place between Christian and Muslims throughout the siege, and there was a constant dialogue between the two during lulls in the fighting. Furthermore, it was only the kingdoms still allied to the Papacy that were engaged in the battle against the Ottomans. The Protestant kingdoms of Europe lifted nary a finger – offering only ‘thoughts and prayers’, you might say. 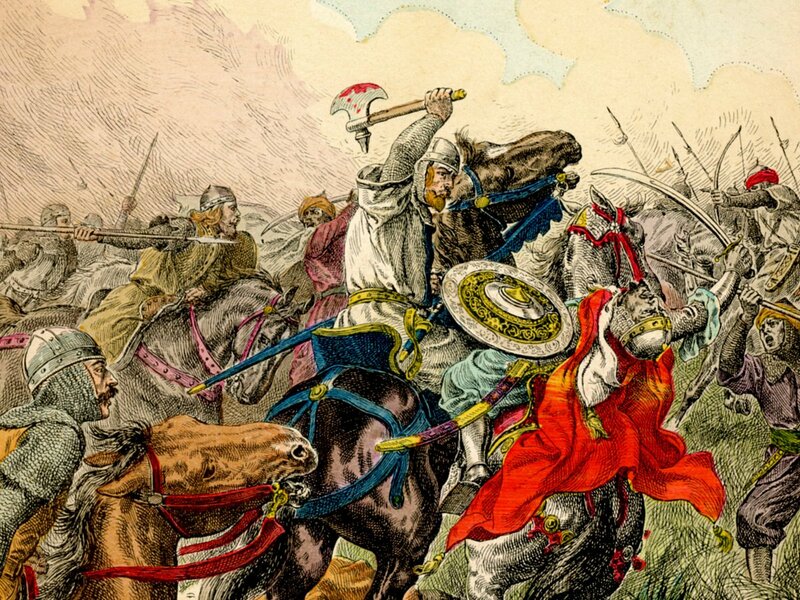 Additionally, when the city was relieved by the forces of King John Sobieski on 12 September of that year, some of the troops who played a most decisive role were the Lipka Tatars, fierce and effective troops who were also Muslim. Indeed, they would be some of Poland’s fiercest defenders for centuries more. A warped view of history is steadily gaining ground across the internet. Each of these conflicts do represent important points in European history, but to try to place them within one long continuum deprives them of much of their context, their nuance and their place in greater conflicts over land, resources and politics. It creates an historical narrative that hangs together only in the loosest sense, and offers a misleading picture of how Christians and Muslims have interacted over time. The graffitied rifle of the Christchurch terrorist proves, more than ever, that history has been weaponised as a tool to radicalise. It uses an ignorance of the past to indoctrinate a generation of fighters fighting for a terrible lie. If we want to avoid further atrocities such as that which happened today, we need to understand and identify how to combat those who turn the past against us.